This game was one of the first games I ever became obsessed with. Lemmings was released to an unsuspecting Amiga crowd in 1990, and was a completely unique game. In it, you had to guide a gullible bunch of rodents from a trap door suspended from the sky to their home and freedom somewhere else in the level. Of course, between base and home is a number of walls, drops and traps designed to hinder your lemmings into submission. The only way to stop this from happening is to assign individual lemmings tasks to traverse the landscape). It starts off with a gentle introduction, but becomes decidingly tricky later on in the game, so much so that the “Loss of Sanity, Loss of Hair & Loss of Sleep” warning on the box isn’t just a humour piece, it’s disturbingly true. The iconic design of this game inspired generations of sequels and knock offs, but they’re missing the point. 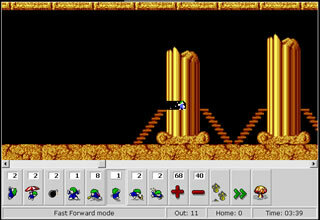 The brilliance of the original lemmings was in the level design. The designers displayed a brilliant cruelty, which encourages players to think outside the box (one such level is early on in the game – “We All Fall Down”, there is a long platform with a drop that’s just a little too far to fall at the end, and you have no floaters. What you have to do is get each lemming to dig an individual hole through the platform, which will safely allow them to fall to the level below). Only by being truly creative and not being rigid in the “tasks” assigned to lemmings can you truly excel at this game. Another interesting point which a lot of reviews neglect to mention is the fantastic two player mode. In it, there are “green” and “blue” lemmings, dropped on a symmetrical level, where the idea is simply to get more of your lemmings back to your base (usually on other sides of the map) in a kind of puzzle version of capture the flag. Not a lot of people mention it as there was only 20 levels on cycle, but it was remarkably fun, and a precursor to similar things such as Chu Chu Rocket. This game is an absolute essential game for anybody studying the history of video games. The early 90’s video game market was rather dry – with endless platformers and shoot-em-ups. This game really began the shake up for games for being a totally original, yet brilliantly fun game. Finally, a few years ago I was speaking to friends about old computer games, and one mentioned that she never played Lemmings. I had a copy of it on a CD which I lent to her. It’s a testiment to a game’s brilliance that even 15 years after being first released, it’s still hooking people like my friend. How many obsessions do you know last 15 years? As a side note, the game was quite cruel, with the designers almost displaying a sick pleasure in destroying lemmings. DMA Design – the makers – would later go on to display similar characteristics under the name “Rockstar North” – the lead designers of the Grand Theft Auto Series. Another great classic, i still have the christmas edition that came on a cover of a magazine too, as well as the commercial ones, truely is addictive, best played in a peaceful environment so not to cause physical damage to others around you from frustration lol. 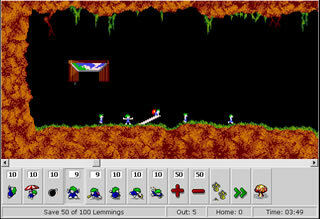 I also remember there’s a DHTML lemmings you can play in your browser! I remember the C64 version! I didn’t buy it, but played a few demos. It had some great SID tunes, and I do remember that it shifted at a fair pace (even if they cut down the play area). Much better than the spectrum version. And the DHTML lemmings was great, how did he make it?!?! ?